The #1 charcoal smoker grill combo should provide a combination of quality, efficiency, and superior taste at a reasonable price. The Oklahoma Joe’s Highland charcoal smoker grill combo fits this description and surpasses it by a mile. Made with a durable high-temperature steel material, this appliance will offer years of use. Some assembly is required, but once assembled you can start cooking your favorite dishes. 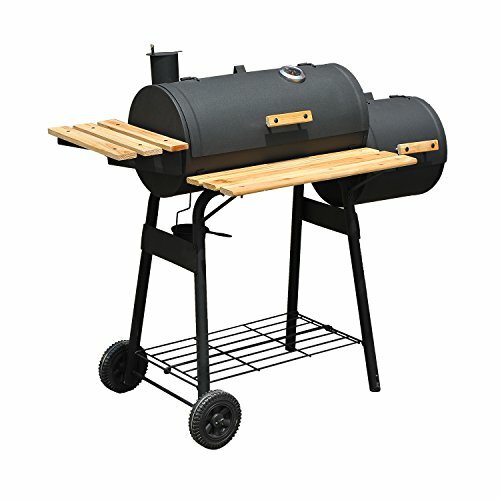 What makes this the best charcoal smoker grill combo? Let’s start with the cooking area. With 619 square inches available, you’ll be able to put a lot of food out on the smoker at once. Monitoring the coals is easy thanks to the cool-touch door handle. To help you wheel the grill into position in your backyard, the appliance has two 10-inch wheels. These wheels are slightly larger than average, making it easier to push the grill over rough terrain. The porcelain-coated cooking grates will significantly reduce your cleaning time. Instead of scrubbing away for hours on end, you’ll be able to apply a damp cloth to the grates and get back to having fun or more cooking. Not everyone wants to stand around the grill all day and cook food, but there are grilling enthusiasts that feel perfectly at home with a beer in one hand and a spatula in the other. The Char-Broil American Gourmet 300 Series charcoal smoker grill combo is perfect for those enthusiasts. The most common piece of feedback about the American Gourmet 300 is that takes a while to heat up and equally as long to fully cook your food. If you choose to go with this smoker grill combo, you’ll want to be prepared to monitor the food diligently. The temperature gauge placed at eye level on the lid will help you gain an accurate idea of how hot the smoker grill is, so you can figure out when to put the food onto the grilling platform and how long you’ll have to smoke it. 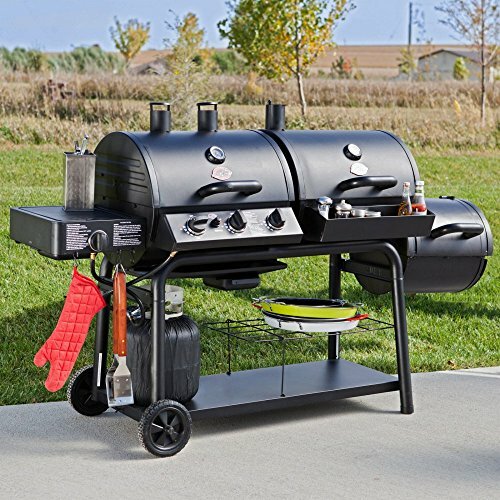 This charcoal smoker grill combo offers a 290-square inch cooking surface along with a 140-square inch warming rack. This gives you plenty of space to cook. No matter how hot the smoker grill combo gets, don’t worry about buying gloves to prevent burning your hands. The Char-Broil American Gourmet 300 comes with cool-touch handles. Once you’re done with the cooking, the porcelain-coated grates can be easily wiped down. You can then move the smoker grill virtually anywhere it fits with the large wheels with durable tread. The versatile Char-Griller Trio gas and charcoal smoker grill can cook virtually anything. You essentially have three cooking units in one. With this smoker grill combo, you have options. The first choice you need to make is the fuel source. You’ll be able to choose between charcoal, gas, or smoking with the firebox on the side of the unit, and the best part is you can use all three at once. If you like to shake it up and use all three of these cooking methods, it makes much more sense logically and financially to pick up the Char-Griller Trio gas and charcoal smoker grill rather than purchasing three separate items. Regardless of what type of meat you’re grilling, you’ll have more than enough room. This smoker grill combo features a total of 1,260-square inches of cooking space; enough room to cook for a few average-sized families. Contributing to this measurement are the two 192-square inch chrome warming racks, which will be useful if you want to slow cook your food or heat up hot dog and hamburger buns. You’ll also notice a brass side burner, as well as dual external thermometers that will help you make the most of your outdoor cooking experience. The side firebox is made with a tough steel that will survive the most rigorous weather, although the optional cover is recommended. There are also a few features that can easily go unnoticed. The lower storage shelf underneath the actual cooking units will keep you from running around and trying to find reasonable space to put your food, seasonings, drinks, gas tank, and charcoal bag. There is also a condiment basket conveniently located right in front of the grill. 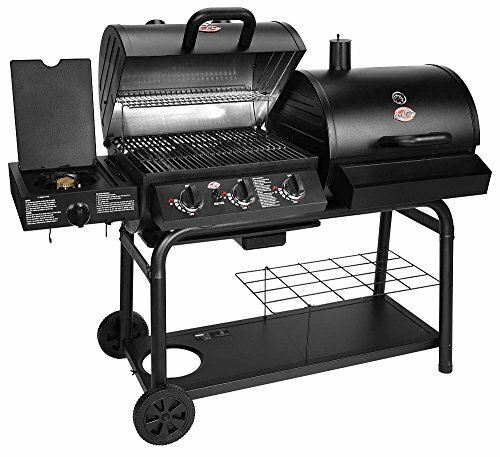 Keep in mind, you’ll have to purchase a fuel source, whether it be charcoal, propane gas, or both, but the smoker grill combo isn’t priced extremely high in the first place. Very similar to the Char-Griller Trio unit, the 5050 is set up with three cooking methods side by side: the gas grill, the charcoal grill, and the smoker. The charcoal and gas units have over 1,200-square inches of cooking space combined, so you’ll have a lot of room to cook, and that’s not even including the smoker. The side burner will emit about 12,000 BTU’s, whereas the 3 burners on the gas side are capable of 40,800 BTU’s! The grate height is adjustable, so you can change how close your food is to the powerful heat source. There is also a chrome-plated warming rack that will allow you to cook at different temperatures. Cleaning the grill is easy. The porcelain-coated cast-iron grates don’t usually absorb food particles and residue, so you’ll be able to take a paper towel or rag and wipe down the grates in no time. The easy-dump ash pan will also take minimal effort if you have something to dump the ashes in. There are two wheels with treads below the grill, as well as a handle that will help you move the unit into your shed, garage, the park, or another party! When looking at the price of the Outsunny Backyard charcoal smoker grill combo, you’ll automatically know that this is for the individual on a strict budget. Don't let the low price turn you off. This inexpensive appliance deserves to be on a list of the top smoker grill combos. The first thing you’ll probably notice is the wood shelves and handles that stand out from the black steel finish. 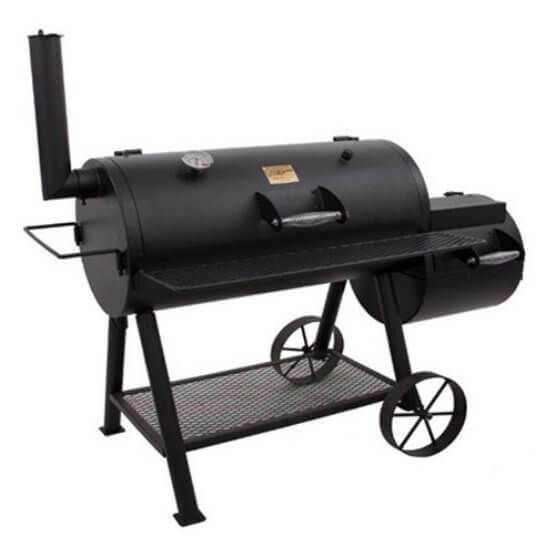 In addition to the metal grate on the bottom, there are two wood shelves attached to this smoker grill combo – one in front of the grill and one on the left side. This will give you plenty of shelf space to store miscellaneous grilling items such as condiments, spatulas, seasonings, drinks, food, and your charcoal bag. 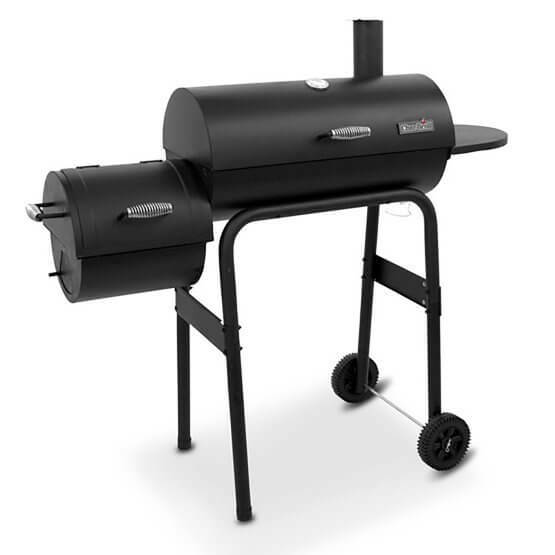 This charcoal smoker grill combo consists of two openings side by side; one for the grill, and one for the offset smoker. While cooking food with charcoal and smoking it provides a similar taste, you’ll now be able to organize what types of meat you want to be grilled via charcoal, and what you prefer smoked. Located on the inside of the main lid is a thermometer that will display the temperature so that you won’t have to ruin the pace of the grilling by constantly opening and closing the lid. Overall, this grill isn’t a bad option if you’re low on cash and want a few cooking options. Granted, it may not be the most durable option, but it is easy to use and offers plenty of space for your grilling items. For these reasons, you should keep this smoker grill combo in consideration. There is a grill on this list for everyone. You just need to know what you're looking for. Due to the relatively higher price tags on these appliances, you should make sure that you choose the right option. If the price is a major factor, you may want to examine the best vertical charcoal smokers or offset charcoal smokers, assuming you already have a grill for your backyard. If you have your heart set on a charcoal smoker grill combo or simply want the convenience that they provide, there are several areas to pay attention to. First, you should consider the number of people that you're cooking for. Do you see yourself cooking for a large group of people or just a handful? This will ultimately determine the size of the charcoal smoker grill combo that you choose to go with. For those that like to have big cookout parties, you’ll want to go with grills like the Char-Griller Trio or the Oklahoma Joe’s Highland charcoal smoker grill combo. These combos have more than enough space to cook for a large group. You won’t have to go through multiple rounds of cooking. Some people like to take their grill with them and be the person who does the cooking. Why not have a charcoal smoker grill combo that is easy to take from one point to another? The Char-Broil American Gourmet 300, Oklahoma Joe’s Highland, and the Outsunny charcoal smoker grill combo are all relatively easy to transport, thanks to wheels along the base. Another consideration is the price. The most budget-friendly option is the Outsunny Backyard charcoal smoker grill combo. This unit is extremely inexpensive and will get the job done. Like we stated earlier, the biggest thing to keep in mind is that price is often a reflection of the quality of the product. Either way, this grill is dirt cheap in comparison to competitors and will give you plenty of space. The smoky taste associated with charcoal grills has become incredibly popular. While grilling is a staple of outdoor cooking, smokers are just starting to become a hot commodity. By purchasing one of these combo units, you are getting the best of both worlds. You can keep grilling while exploring the advantages of smoking your food. We should break down how to use a smoker. While smokers tend to take much longer to cook meats, it will positively affect the overall texture of your food. The first thing you’re going to do is light up a large amount of charcoal in a chimney starter. It should take about 15 or so minutes for that to ash over, and from there you’ll add the lit coals to the intake. By using the vents of the smoker, you’ll be able to influence how much air enters the grill. This will give you full control of the temperature, as oxygen is a catalyst to heat when it comes to charcoal. If you want your meat to become more flavorful and tender, you can add small sprays of water or a flavored liquid substance. After giving it some time to slow cook, you should be on your way to having a delicious smoked meal. For those not too familiar with grills in general; be prepared for slow cooking. Smokers tend to cook slow, at lower temperatures, so that it can properly break down leathery meats into a more tender cut. Charcoal smokers typically use indirect heat that comes from lit charcoal and applies it to the meat. Grills, on the other hand, are set up so that the heat source is in direct contact with the food; cooking the meats much faster as a result. It’s useful to have a smoker grill combo because some foods taste better cooked directly, whereas other cuts are better cooked indirectly. We all have cravings. When it comes to cooking food outdoors, sometimes you’ll want your food grilled, while other times you’ll prefer it to be smoked. With charcoal smoker grill combos, you’ll have this option at your disposal whenever you want to enjoy outdoor cooking.